Thank you for searching our website, Artistic Image Salon & Day Spa. We are Located at 16255 W 64th Ave., Unit 12 on the S.E. corner of West 64th and Quaker St. in Arvada, CO 80007. Our experienced staff are available to serve your needs. 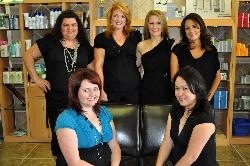 Artistic Image is a locally owned business and a full service salon. We welcome your business. Hair Care- Precision Cutting,, Color Correction, custom color techniques, high-lites, low-lites, designs perm wraps, spiral perm. Specialty Scalp Treatments- Nixon Scalp Renew, Indian Champissage with Aromatherapy. Manual Lymphatic Drainage (MLD). Artificial Nail Care- Pink and White, Silk, Fiberglass, Gels, Acrylics. Natural Nails Care- Spa Pedicures $ Spa Manicures, Shellac with Manicure or Spa Manicure. Facial Treatments-Bio-Therapeutic, LaStone, Manual Lymhatic Drainage and all of the Classic Facials. Body Touch Therapy Treatmnets- La Stone with Aromatherapy, Reflexology with La Stone and Aromatherpy, Manual Lypmphatic Drainage (MLD), Indian Champissage with Aromatherapy, Chinesse Acupressure Points with Aromatherapy. Thermal Body Therapy Treaments- Thermal Stamp with Deep Body Therapy, Back Purification, Arms, Legs, Decollete, Hands. Beauty is our field of expertise, let us help you look and feel your best. See what we offer in coupons to help you save on your favorite services. You can Contact us today for an appointment. Walk-ins are always welcome, as well. Types of Payment Accepted: Visa, Master Card, Discover, Debit, Personal Check, Cash, Gift Certificate.